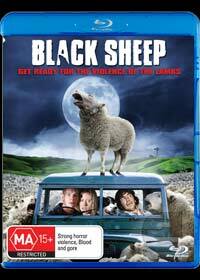 Black Sheep is your classic horror movie spoof by writer/director Jonathan King who masterfully directs this film in the highlands of New Zealand which ironically revolves around mutant sheep. You automatically know that you are in for a treat early in the move from its opening scenes where Henry's brother Angus, brutally murders his brothers sheep and then wears its coat to scare Henry. Fast forward 15 years later and Henry is unfortunately suffering from post traumatic stress syndrome and cannot stand to be around sheep. Henry however, returns to his family's property in order to receive a cheque from his brother for half his share in the lands, only to discover that Angus has been creating genetically modified sheep who hunger on human flesh. Although quite an original movie, Black Sheep sometimes fails to deliver as it attempts to meld both the humorous and seriousness "topics" together. With that said, Black Sheep has some classic moments thanks to some truly dodgy and entertaining special effects and although it may not be on the same level as Shaun of the Dead, it's definitely a movie for those who enjoy the horror spoof genre. Presented in 1080p HD Widescreen, this is truly a cinematic experience as the attention to detail is amazing and it is almost like you are walking through the highlands of New Zealand. Match that with perfect sound and a very entertaining audio commentary plus some great deleted scenes and Black Sheep is one enjoyable ride, even though some bits miss the point.